Tweak: Improve migration replace process to run over 4 sequential smaller processes to be less database heavy and improve stability. Fix: Upload was failing when library was using access keys defined via wp-config constants. Fix: Now returns full image when theme requested image size is bigger than full image. Fix: Fetching single remote image sizes was failing whenever the image thumbnails were manually removed. Fix: Failing to generate thumbnails for objects which key contains spaces. Fix: Copy to local of audio and video files was not producing a local url. Fix: Copy to local option now working for divi builder. Fix: Copy to local option was failing when libraries from different services were using the copy to local option. Fix: Saving of Remote Media Settings metabox options was failing under certain conditions. Fix: Remote Media Settings metabox was duplicated when others plugin from the RML suite are installed. Fix: Remove PHP notice occuring when a media item with an empty alt text was copied to local library. Fix: Prevent error when bucket object is no longer accessible. Fix: Allow images of 0 bytes to work has thumbnail. Fix: Folder filter would not select back to all folders properly since last update. Fix: Thumbnail generation tool status was not accurate since last update. Tweak: Improve migration process to run on shared host servers that impose strict time execution limit of less than 30 seconds. Tweak: Assets module validation process to be less vulnerable to 3rd party plugins conflicts. New: Module for Easy Digital Downloads. Enables expiring links to private bucket objects for user download using S3 pre-signed URLs. Fix: Bucket objects listing edge case. When the last object of a page was not of the filtered mime type, the previous object was not displayed. Fix: Remove application of intermediate_image_sizes_advanced filter. This was not needed and applied in a context that could cause conflicts with other plugins. Tweak: Update DreamObjects default endpoint to their new west server. New: Assets CDN module. This allows serving of your theme and plugins assets from CDN like CouldFront. New: Introducing support for Elementor page builder. Tweak: Improve performance when theme requests for an image that is bigger than available full size to return full size directly. Tweak: Improve Gutenberg support. Folder filter was displayed with a too short width. Tweak: Improve handling of scripts and styles to facilitate re-use and 3rd party plugins integrations. Add option to use defined access keys constants in wp-config.php. Fix: insert button text display issue for 3rd parties custom fields when copy to local option is selected. Fix: metadata saving could fail when file path includes special characters. Fix: image sizes generation could fail when triggered from the theme front-end. Added latest bucket regions: Europe (Paris), China (Beijing), China (Ningxia) and Asia Pacific (Osaka-Local). 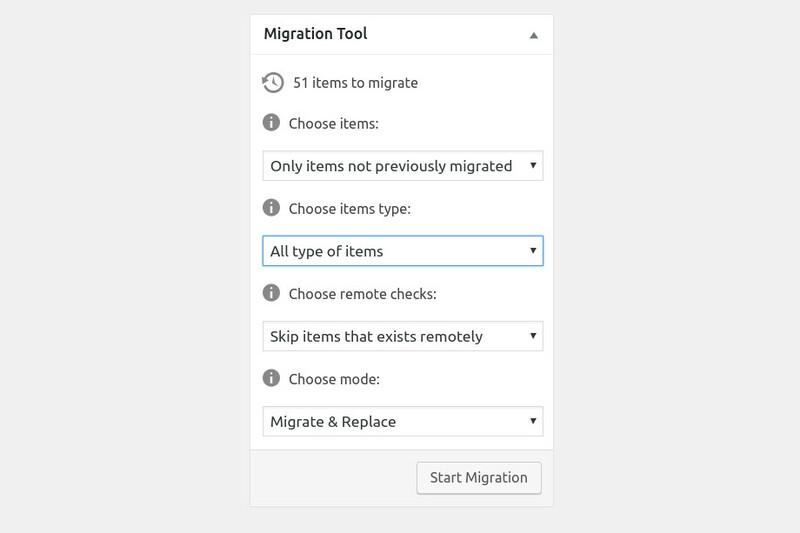 Introducing new migration feature. Now possible to backup, migrate & replace all local media items. Fix: Improved handling of remote metadata (title, description, caption and alt text) for sharing accross sites. 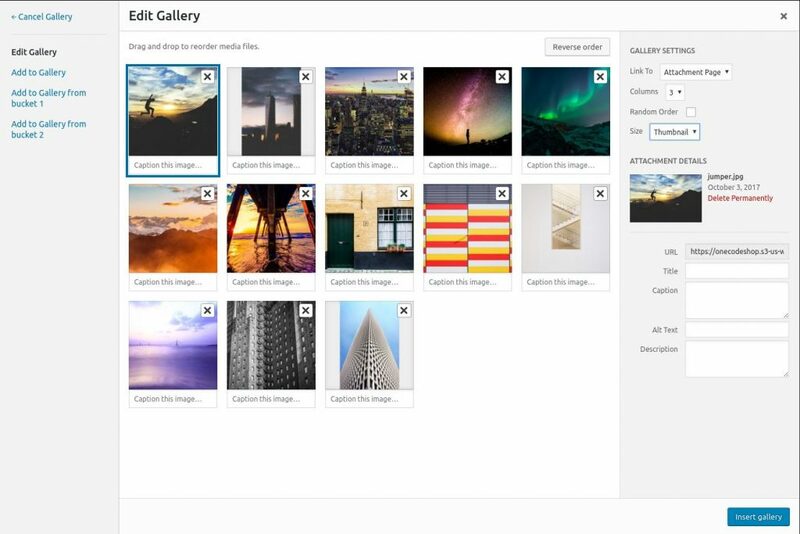 Fix: Set gallery remote attachments by chunks to prevent hitting server post_max_size limit when adding 100+ images to gallery. Fix: Creating of large galleries (100+ images) could be rejected by server max_input_vars limit. More gracefully handles multiple upload errors. Metadata is saved with S3 metadata and available to all your sites. 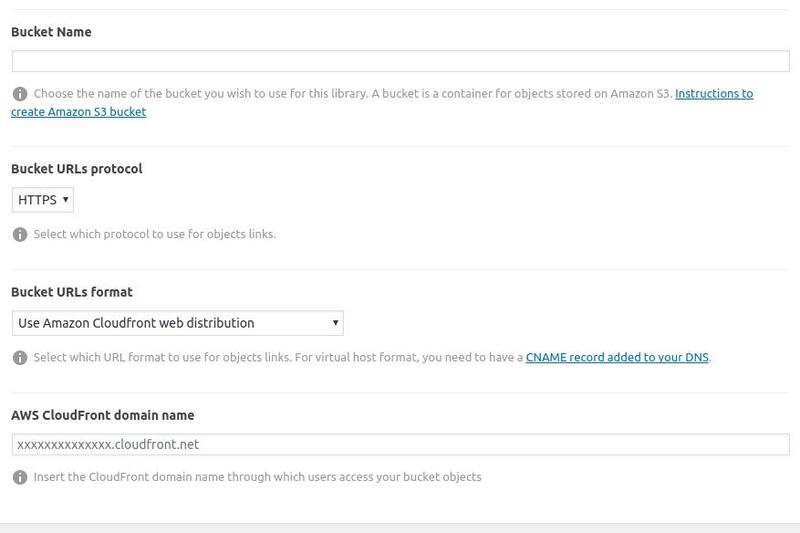 RML for Amazon S3 gives you access to your buckets media items right into the WordPress Media Library. 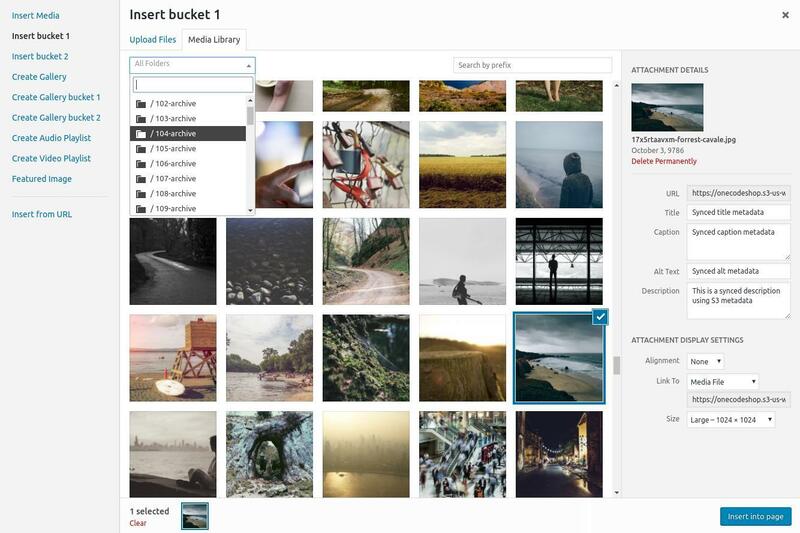 It allows you to browse and search through all your bucket objects with folder filters and then quickly insert them to your posts or pages, use them as feature images or create galleries just as if the they were in your local WordPress Media Library. You have options to serve your file with the default S3 objects URL, with virtual hosting of bucket or with Amazon CloudFront distribution network. This will not only speed up your site, but also enables you to share the same media library across multiple sites. Even more, the plugin provides you tools to efficiently manage your remotely hosted media items like a migration tool and image thumbnail generating tool. All of this professionally made with care for every details. Seriously! Connect as many buckets as you want and with as many media files as you want. No limit! Speed up your site ...fast. 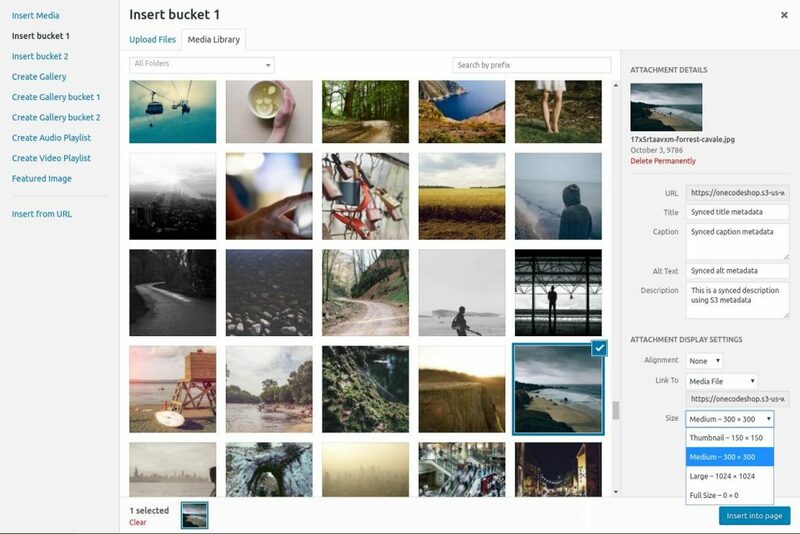 Easily migrate your media to your S3 bucket with our migration tool. You can backup all your media library items to your bucket and optionally replace the links of your local media items with their S3 hosted counterpart. 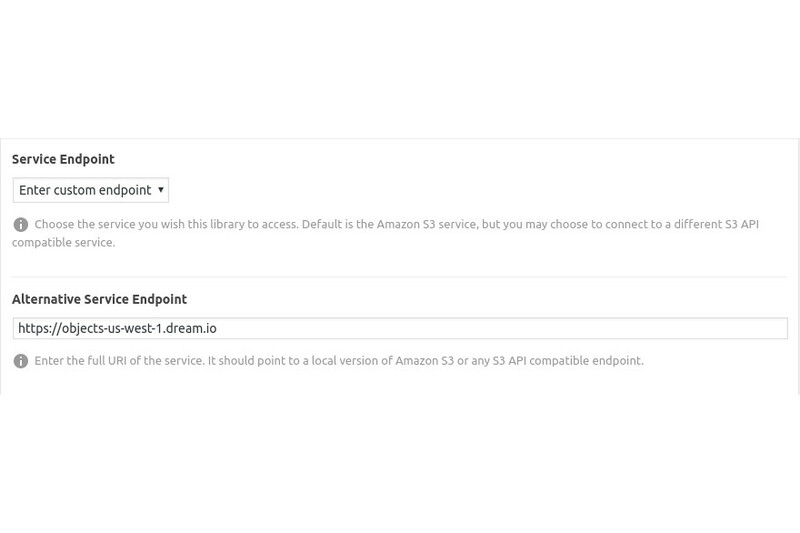 Then, benefit from Amazon CloudFront CDN power by setting up the plugin to serve your items from it. Your bucket is full already? You already have a S3 bucket full of media items? Unlock access to it. Create a remote library with your bucket settings and right there you will have a live view of your bucket content available in your media library menu for you to use. No sync needed. You still have access to your local media library. Stop uploading the same file over and over again. 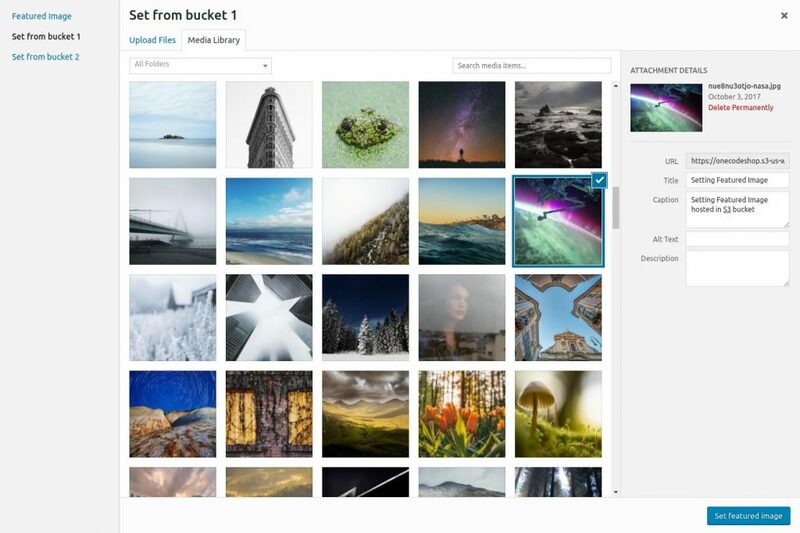 Choose the bucket you want in your media library menu and upload directly to your bucket. Your sites have different themes and do not use the same images sizes? No worries. The plugin automatically generates any missing thumbnails whenever you insert an image on your site. Upload once, use anywhere. 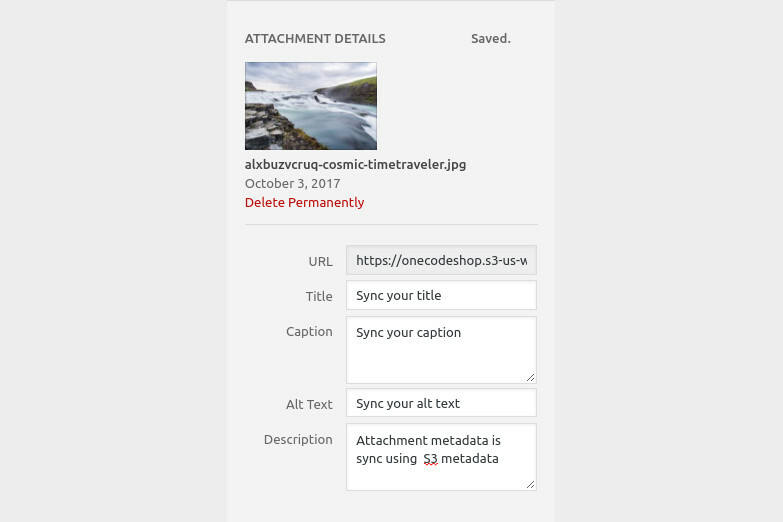 Also your media items metadata is saved using S3 objects metadata keeping your metadata like title, alt text, caption, description in synced across all your sites. For example, change an image description on one site and it will be available everywhere. 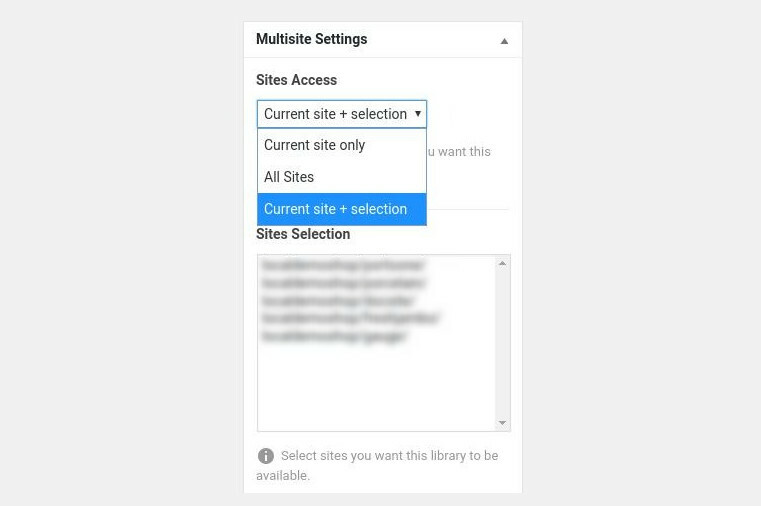 Your sites are set up on a multisite installation? Use our multisite support license and share the same media library within your multisite network. Build your site for speed right from the start. Setup your development site to use media hosted on S3 and easily deploy to production without the need to deploy any media items! The plugin is carefully developed so that it works out of the box with most themes & plugins. The list of themes and plugins is outstanding out there and occasionally, custom work will be needed to enhance compatibility with some of them. If this turns out to be the case, we are glad to help and make the necessary changes promptly. Here is a quick list of plugins that we worked on and knows that works. Note that if your plugin is not in this list, it might well be compatible, but did not get any report on it yet. Please touch base with us if you have questions regarding compatibility with any plugin or theme you use. We continuously work to make your S3 buckets content easily available for any wordpress sites.